People play different roles in their lives. One might be a spouse, a parent, and a mem- ber of staff at the same time. However, to fireman Ben Cheung Wai-leung, the situation is more complicated. The four-time gold medallist in fencing was born in a worker’s family and had six siblings. He showed his interests and talents in sports when he was small. “We lived in the New Territories and there was plenty of room for an energetic and active children like me to move around and play,” he said. Mr. Cheung was poor student in those days. “I was lazy in Primary 3, so I did not prepare for my examinations and I almost came last in class. My mother was so furious that she threw my schoolbag away,” said he. “The moment I saw her cry while she was scolding me, I realized how much she loved me and how wrong I was,” he recalled. From then on he studied hard and eventually came first in his class when he was in Primary 6. After graduating from the Hong Kong Polytechnic and working as a material planning official in a factory for about 2 years, Mr. Cheung joined the Fire Services Department as a preliminary station officer. “I did not expect to achieve a lofty goal when I became a fireman. It was just an ordinary occupation to me,” Mr. Cheung explained. Nevertheless, what subsequently happened to Mr. Cheung was not ordinary. He lost his left leg in a rescue in 1983. “I still remember it was 3 September and typhoon signal No. 10 was hoisted. I was working in the Wan Chai Fire Station when a landslide occurred in Western District. We were responsible for the rescue. When I was helping an old lady out near the shore with another officer, the soil slipped again,” Mr. Cheung said. He was pushed into the sea while his colleague was crushed against the rocks and died. “I almost died in that accident. I was stuck up by the mud. At that moment things and memories flashed into my mind. But all I wanted was to keep alive,” he said calmly. Mr. Cheung was taken to the Queen Mary Hospital afterwards. “I threw up a huge heap of sand and mud and had high temperature for about 2 weeks.” Then he was informed that his rotten left leg had to be cut off. Mr. Cheung’s disability did not fend off his enthusiasm for sports. He swam and played basketball to exercise his legs at the rehabilitation centre. In 1991, he joined a fencing class organized by the Hong Kong Sports Association for the Physically Disabled and he turned over a new leaf in life. “I chose fencing simply because I had never tried it before,” Mr. Cheung smiled. While others quit the class later, he was the only one who stayed. Like many beginners, Mr. Cheung imitated other successful players’ moves when he first started fencing. “I tried to learn from them but I found myself copying their errors as well. Then I realized asking for advice was important. Be humble and open and you will get what you want,” he said. Mr. Cheung entered his first international fencing event, the World Wheelchair Fencing Championships, with the Hong Kong Team in 1994. “I came sixth in the individual foil section and was awarded the Best New Player prize. That was a good start for me,” said he. 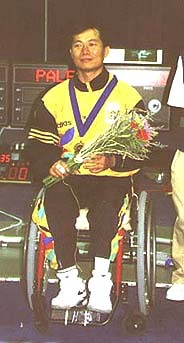 The first gold medal for Mr. Cheung came in 1995 at the Italy Invitational Wheelchair Fencing Competition. “The success boosted the confidence of not only myself, but also the entire Hong Kong Team. However it also put great pressure on me,” said he. In the Atlanta Paralympic Games, Mr. Cheung, together with his fencing teammates Albert Chan Kam Loi, Raymond Chan Sze Kit, Ben Chui Man Fai, Eric Kwong Wai Yip, Lau Sik and Nelson Tai Yan Yau won four golds, one silver and two bronzes in epee, foil and sabre. Mr. Cheung bagged two individual gold medals in epee and foil. “I did not expect such encouraging and splendid results for the individual competitions. But I was quite sure we could win in the foil team. I had confidence in my teammates,” said he. Mr. Cheung’s success carries some impact for local society. “I hope the public will know more about the disabled, their sports and not to look down upon us,” he said. Besides, he would like to prove that Hong Kong athletes could play as good as players from other countries. 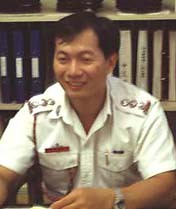 Since the accident in 1983, Mr. Cheung has been working in the breathing apparatus section of the Fire Services Department. 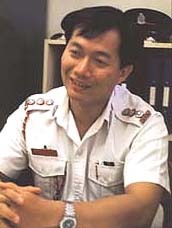 He is now a senior station officer at the Hung Hom Fire Station. Wai Ka Wing regards Mr. Cheung as his mentor and companion. “He has taught me a lot and he is a respectable supervisor as well as a reliable friend. Sometimes we go fishing and go to have meals after work. He never considers himself superior to us. “However well he has done in the competitions, he never shows off. 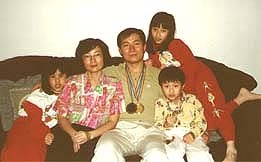 We did not know he got four gold medals until we read the papers,” Tsang said. Besides a bold fireman, a helpful colleague, a good-natured of acquaintance and a Paralympics champion, Mr. Cheung is also a “family man”, to quote his wife. “Wai-leung is an honest and reliable husband. Although he has to work in the day and practise fencing every Monday, Wednesday and Friday evening, he still can look after the family,” said Mrs. Cheung. Mr. Cheung has three children, Po-man, Hin and Hei. The indoor family activity he does most frequently during leisure time is to help his children with their homework. “Sometimes we go swimming and catch little crabs on the beach,” Mr. Cheung said, grinning. “My family is certainly a great support to me as an athlete. My children comfort me when I lose in the competitions. They encourage me to try again next time,” said Mr. Cheung. After the Atlanta Paralympics, Mr. Cheung’s daily life has changed. It is filled up by interviews, lectures at schools and other social services. But the biggest change is to be recognized by the public. “Once a man of my age approached me for autograph in the street. It is quite embarrassing though he was really sincere. In fact, I would rather be just an athlete than a celebrity,” he said.